United States. Congress. Senate. Committee on Public Works. 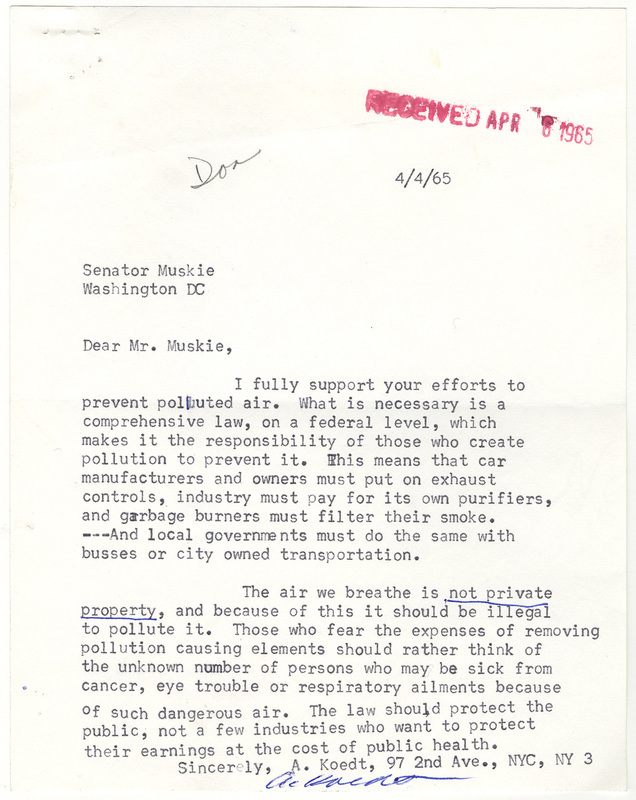 "A. Koedt to Edmund S. Muskie in Support of Clear-Air Legislation." A. Koedt to Edmund S. Muskie in Support of Clear-Air Legislation, April 4, 1965; filed with Muskie to Koedt, April 13, 1965; “S. 306 Hearings—Clean Air Act amdts, April 6th & 9th (7th. Detroit)” folder, Legislative Files, Box 3; Committee on Public Works; 89th Congress; Records of the U.S. Senate, RG 46; National Archives.. Accessed 19 April 2019. http://acsc.lib.udel.edu/items/show/322. A. Koedt to Edmund S. Muskie in Support of Clear-Air Legislation, April 4, 1965; filed with Muskie to Koedt, April 13, 1965; “S. 306 Hearings—Clean Air Act amdts, April 6th & 9th (7th. Detroit)” folder, Legislative Files, Box 3; Committee on Public Works; 89th Congress; Records of the U.S. Senate, RG 46; National Archives.